​Shelley Costello is a dynamic speaker who has shared the speaking stage with Emmy Award winner, Les Brown. 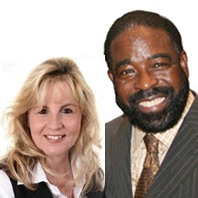 Click here to Read Les Brown's Personal Testimonial for Shelley Costello. Shelley Costello, a very talented speaker captivates her audience and speaks on many topics such as technology, social media, systematizing your business, and much more. She can create presentations that reflect the big picture, but break it down into easy to understand and engaging. Using the latest technology, Shelley captivates her audience and empowers them to take action immediately. Shelley is a published author with books on the subject of Social Media and Internet marketing. Shelley has delivered presentations in-person, in webinars, and on podcasts. She has been presented to large Fortune 500 corporate marketing staff members, large groups, technology schools, and business workshops and worldwide on training webinars. Shelley has shared the stage with Emmy Award winner Les Brown. 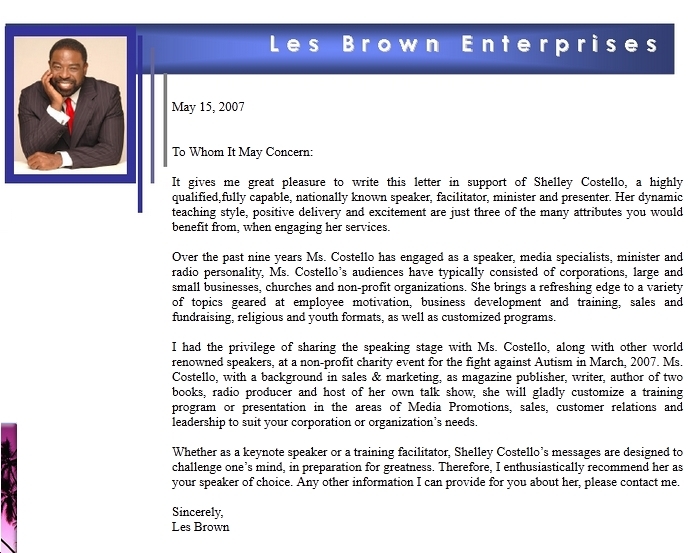 Look what Les Brown has to say about Shelley Costello. Speaking topics: Social Media Marketing, Business Growth, Future Age Web Marketing, Successful Networking and more. Shelley Costello is a two time #1 International Best Selling author and speaker on the subject of social media. Shelley is a very talented speaker and has a special way of captivating her audience. She can create presentations that reflect the big picture, but break it down into an easy to understand and engaging message. Using the latest technology, Shelley captivates her audience and empowers them to take action immediately. Shelley has delivered presentations in-person, in webinars, and on podcasts. She has been presented to large Fortune 500 corporate marketing staff members, large groups, technology schools, business workshops and worldwide on training webinars. Instead of Lunch & Learn events she comes to your place of business and hosts a "Munch & Motivate™" which she currently has under Trademark for her lunchtime speaking gig brand. Shelley has shared the speaking stage with Emmy Award winning speaker Les Brown. "Shelley Costello is a highly qualified, fully capable, nationally known speaker, facilitator and presenter. Her dynamic teaching style, positive delivery and excitement are just three of the many attributes you would benefit from when engaging her services. Whether as a keynote speaker or training facilitator, Shelley Costello's Messages are designed to challenges one's mind in preparation for greatness. Therefore I enthusiastically recommend her as your speaker of choice ." Some of Shelley's speaking topics are conscious marketing, visionary and visual power, Brand positioning, Authenticity, Social Media Marketing, Business Growth, Successful Networking, Business Development and the art of storytelling for marketing.